Do you find that sandwiches always taste better when someone else makes them for you? I do. If you make your own sandwiches and enjoy them, can you tell me your secrets? Sure, I like a luscious grilled cheese sandwich made with leftover curried onion jam. And I can always snuggle a cold slice of any of these frittatas between two pieces of whole wheat toast swiped with mayonnaise and harissa. But a real, well-composed, flavorful vegetarian sandwich takes some work. I usually leave it to the professionals. Or, you know, anyone else who’s offering to make me a sandwich. But a spread? A spread I can do. In fact, I learned, I can make this one with one hand while holding a clingy baby in the other arm. (When I was preparing to welcome my first baby, why didn’t anyone tell me to practice feeding myself with one hand? I’ve got some experience by now, but even if you’re a novice, you too can make this spread with one hand.) It was inspired by this good-looking sandwich from the makes-me-want-to-eat-cookies blog Two Peas and Their Pod. But you know how I feel about making my own sandwiches. You also know how I feel about making my own beans, but on this occasion I used canned chickpeas. No biggie. They get a bit lost in the smash anyway, adding more texture and protein than flavor to the creamy, salty, mustardy spread. And although this would be a perfectly acceptable dip for veggie spears (or chips, for that matter), I heaped it onto rounds of a seedy baguette. Almost like a sandwich. 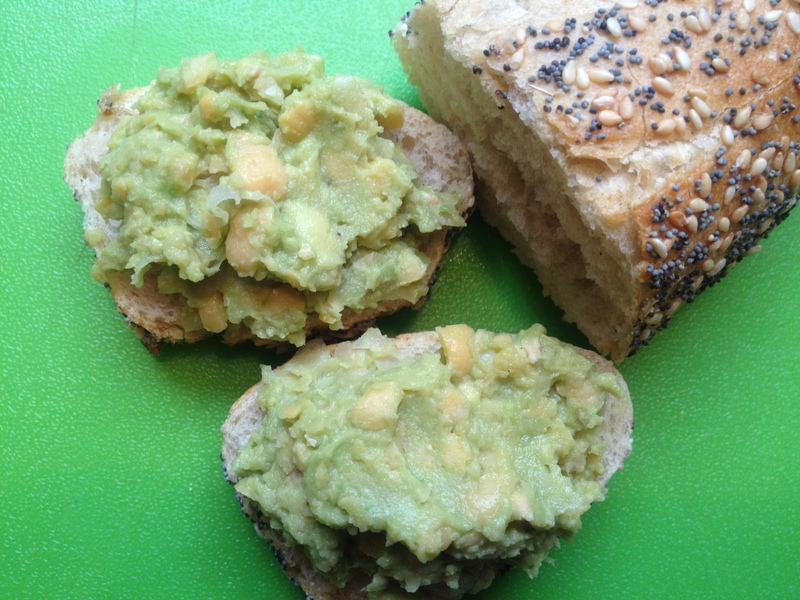 Chickpea and Avocado Smash: Use a fork to coarsely smash 1 1/2 c. drained chickpeas (rinsed if they are from a can). Scoop in a ripe avocado and smash again, leaving some chunks. Give it a good sprinkle of sea salt, a big squeeze of lemon, and a dollop of dijon mustard. Adjust seasoning to taste and serve with baguette slices, crackers, or veggies. This entry was posted in Beans and Other Legumes, Snacks and Apps, Vegan or Would-Be-Just-As-Good-Vegan and tagged beans, cooking, dinner, DIY, family, food, homemade, lifestyle, recipes, vegan, vegetarian on March 27, 2012 by emmycooks. This will be dinner, on a Dave’s Killer Bread bagel. Thanks! Nice, it was my lunch today! I love Dave’s Killer Bread but have never had their bagels, I will have to keep an eye out for them. Because you are right, that sounds like a perfect combo. That is a fantastic idea. Chickpeas are always around the kitchen and good avocados are not hard to find. Excellent.